At her father's insistence, Tara McConnell, a freedom loving American, has spent the past year living with her aunt in London and learning to be a lady - her English mother's dying wish. But while Tara has mastered the manners and secured the admiration of the young lords of London, her heart longs for home. And, as a girl who grew up aboard her father's ships, her feet itch to return to the sea. She's been tethered to land too long. When a letter from one of her brothers arrives, telling her that her father is seriously ill, she refuses to wait any longer. Her aunt agrees to let her leave but only if a maid accompanies her and only if she sails to Baltimore aboard the Wind Raven, a ship captained by the son of one of her aunt's friends. When the maid falls ill on the way to the docks, Tara sends her back and boards the ship alone, unaware that her trip to Baltimore has just taken a decidedly dangerous turn. The last thing Captain Nick Powell needs is a woman aboard his ship. Not only are they bad luck and a distraction to his crew but Nick has a secret agenda on this particular voyage - a detour to the tropics to complete a very dangerous task for the Prince Regent. He'd hustle her right off his ship if not for the note she carries from her aunt, claiming friendship with his mother. He dare not incite his French mother's temper and with her out of the country there is no way to verify the note. He has no choice but to let the woman sail with them but he doesn't have to be happy about it. Tara and Nick are at odds from the get-go, with the sunny and immensely likable Tara determined to use her well-honed skills to work with the ship's crew and brooding Nick equally determined to keep her off the deck and out of their way. Their stubbornness is well matched, as is their unwanted attraction. With a long sail ahead of them, sparks are sure to fly but while Nick is more than happy to "scratch their itch," his heart is under lock and key. Or so he thinks. By the time they reach Bermuda, feelings have started to become entangled within the desire but a deadly pirate will put those new-found emotions to the test. While Tara knows her heart well, Nick's heart still bears the scars of an earlier betrayal. Will he continue to paint Tara with the same brush as the woman who broke his heart or will he awaken to the truth before she's lost to him forever? Once again, Regan Walker has expertly woven together interesting historical facts with an intriguing and fast-paced story that kept me reading way past my bedtime and still thinking about the characters long after I turned the final page. Her characters, from the intrepid Tara to the brooding Nick to the villainous but strangely sympathetic pirate, Cofresi fairly leap from the page. Richly drawn secondary characters complete the picture along with detailed descriptions that convinced me I could feel the deck of the ship rolling under my feet, the warmth of the tropical sun on my face and the sweet island breezes flowing gently through my hair. Whether she's writing a romantic love scene, a breath-stealing pirate raid or an anger-induced confrontation between Tara's American brothers and her English lover (men unaware they have a contentious history until they finally come face to face), Walker never fails to engage my interest and place me squarely in the center of the action. 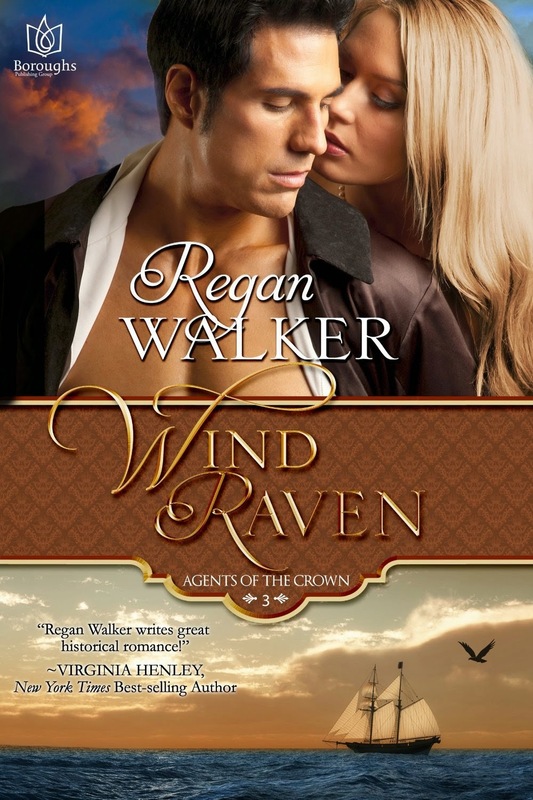 I love a good sea-faring, pirate romance and Wind Raven certainly fills the bill. I highly recommend this book. PJ, I am half way through WIND RAVEN and loving it. As you said, her historical details are good and well woven into the story. Her descriptive writing believably puts you on deck in the middle of a storm and on a lush, tropical island. I have only briefly met the pirate and the brothers aren't there yet. The ship's crew and English ex-patriots living in Bermuda are well drawn individuals. Even Tara's tomboyish behavior and dress do not seem out of place or "pushy" to make a point. They are a natural extension of who she is and the way she was raised. I will be reading more of her books. Pat, I am so glad you are enjoying Wind Raven. Wait till you get to my Author's Note and you will see women like Tara, though rare, did exist--and centuries earlier, too! Oh, PJ, thanks for the great review...I am delighted you liked Wind Raven! It makes me smile to know you liked the characters and could feel the deck rolling beneath your feet. I've not read her as yet but this definitely sounds like something I would enjoy! Thanks for stopping by to read the review! I will definitely be adding this book to my TBR list. I always enjoy reading books with the sea in it. Pirates, Captains and ladies.....a win-win for me! Thanks, Dalila! I do hope you like it--and the others in the trilogy. All very different stories.